As atheists become more visible in our society, the entire “War on Christmas” back-and-forth feels ugly and unnecessary. Worse still, it seems to do little more than offer ammunition to those claiming atheists are just mean-spirited grinches. Bill O’Reilly—one of the major “War on Christmas” soldiers—made that clear when he and I discussed the “War on Christmas” a couple of weeks ago. Let’s not kid ourselves: There is no war on Christmas. We live in a culture that privileges stories of conflict, so it’s understandable that this narrative would gain traction—with or without billboards. Much of this narrative is a manifestation of religious fears about our increasingly secular society, and it reflects widespread anxieties about atheists and religious differences. But it doesn’t reflect reality. It’s not that Christmas is under attack; instead, our society is becoming better at embracing its religious diversity and challenging the notion that a single majority religion should dominate public expressions of belief. So why does the “War on Christmas” narrative persist? Based on how much play they give it each December, the “War on Christmas” narrative seems to be good for Fox News ratings. And American Atheists has openly admitted that it is good for their pocketbooks, as their talk show appearances bring in a swell of donations. In other words: American Atheists and Fox News - alongside conservatives like Sarah Palin - seem to have discovered a mutually beneficial relationship. But does this relationship benefit atheists more broadly? Does it accurately represent the sentiments of nontheists in this country? Does it improve atheist-theist relations? Does it lessen the widespread stigma and distrust that exists between atheists and theists, which enables atheist marginalization across the U.S.? Does it invite Christians to think critically about religious privilege? Many atheists, myself included, suspect that there are more effective approaches to tackling these important issues. To start, atheists can build positive relationships with believers to humanize our communities and educate one another about our differences. That’s something that billboards, for all of their flash and fundraising capabilities, likely won’t accomplish. Atheists face real marginalization in the U.S., and it should be robustly challenged. But we also have good tidings and great joy to offer—important contributions to the public square that are currently being drowned out by attention-grabbing billboards claiming “nobody” needs Christ in Christmas. In the spirit of generosity, compassion, and kindness so often associated with this time of year, let’s ditch the billboards and build relationships of goodwill. Chris Stedman is the Assistant Humanist Chaplain at Harvard University, Coordinator of Humanist Life for the Yale Humanist Community, and author of "Faitheist: How an Atheist Found Common Ground with the Religious." You can follow him on Twitter at @ChrisDStedman. The views expressed in this column belong to Stedman. « Previous entryDoes Phil Robertson get the Bible wrong? 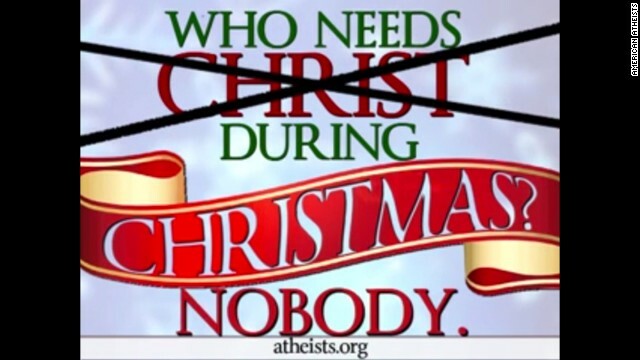 “Silverman’s notorious anti-Christmas billboards and subsequent TV appearances have breathed new life into American Atheists and are often followed by an uptick in subscribers and donations. .."
LOL...Just like the TV preachers they so despise. "John Hick, a noted British philosopher of religion, estimates that 95 percent of the people of the world owe their religious affiliation to an accident (the randomness) of birth. The faith of the vast majority of believers depends upon where they were born and when. Those born in Saudi Arabia will almost certainly be Moslems, and those born and raised in India will for the most part be Hindus. Nevertheless, the religion of millions of people can sometimes change abruptly in the face of major political and social upheavals. In the middle of the sixth century ce, virtually all the people of the Near East and Northern Africa, including Turkey, Syria, Iraq, and Egypt were Christian. By the end of the following century, the people in these lands were largely Moslem, as a result of the militant spread of Islam. Most of us will be dead in 35 years. Some will die in less than 5 years. Some tomorrow. Everyone capable of reading this post will be dead in 70 years. All that will remain of each one of us r bones or ash, unless our tissues/organs live on in someone else. It was a long lonesome day.